Fort Bowie provides insight into a clash of cultures between a young nation in pursuit of manifest destiny and the Apache society fighting to preserve its existence. For more than thirty years, Fort Bowie was a focal point of military operations which eventually culminated in the surrender of Geronimo in 1886. It was the site of the Bascom Affair, a wagon train massacre, and the battle of Apache Pass, where a large force of Chiricahua Apaches under Mangus Colorados and Cochise fought the California Volunteers. Hostilities were triggered by the Bascom Affair which began on January 27, 1861, when Apaches raided John Ward’s ranch, stealing livestock and kidnapping Ward’s twelve-year-old stepson Felix Ward. Ward complained about the raid to Lieutenant Colonel Pitcain Morrison, the commandant of Fort Buchanan, Arizona, who directed Lieutenant George N. Bascom and a party of infantry to attempt to recover the boy. Bascom determined that the raid was done by Chiricahua Apaches and Morrison ordered Bascom to use whatever means necessary to recapture the boy. Bascom, Ward, and fifty-four soldiers arrived at Apache Pass on February 3, 1861. Bascom convinced Cochise to meet with him. Cochise brought several members of his family to the meeting where he claimed he knew nothing of the affair. Bascom tried to imprison Cochise and his family, but Cochise slit the tent and escaped with a leg wound. On February 5, 1861, Cochise pleaded with Bascom to release his family, but Bascom told Cochise that they would be set free when the boy was released. The next day, Cochise and his Apaches attacked a group of Americans and captured three hostages, offering them in exchange for his family. Bascom insisted that he would accept nothing other than the return of the boy and cattle. On February 7, 1861, Cochise and his men attacked Bascom’s soldiers while they were watering their mules. Cochise fled to Mexico. On the way, he killed his American prisoners and several days later, Bascom hanged Cochise’s brother and nephews. The historic hike to the Fort Bowie Visitor Center from the trailhead is one and a half miles and crosses the Butterfield Overland trail, passes the post cemetery, the remains of the Chiricahua Apache Reservation Indian Agency building, the Apache Pass Battle site and Apache Spring. Interpretative plaques explain the historic events that took place along the way. Until Fort Bowie was designated as a national historic site, visitors scavenged the site for relics. In 1958, two brothers from Arkansas searched for relics with their metal detectors and found a rusty cannon ball near the building which once served as a residence for the hospital steward. In 2002, one of the brothers sent it back to Fort Bowie with a letter saying that he had it for forty-four years and that it belonged back at Fort Bowie. The cannon ball, probably fired during the Battle of Apache Pass in 1862, is on display at the Visitor Center. It is the only unexploded cannon ball that was fired during the historic battle between General James Carleton’s California Column and the Chiricahua Apaches led by Cochise. A mountain howitzer typical of the type used in the Battle at Apache Pass is on display on the porch of the visitor center. Other items on display include a copper water pitcher, a dental molar extractor, a bayonet, pistol, padlock, historic uniforms guns and a dress helmet plate. 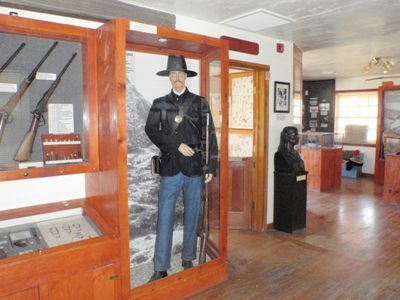 The walls of the visitor center feature photographs of military personnel who served as Fort Bowie and images of Apache scouts. Memorabilia of Apache life include a cradle, moccasins and a wickiup.